The idea for this puzzle came on a commute to work into London. In the bottom corner of my ticket was the double arrow logo which I remembered very clearly from British Rail TV advertisements in my teens. Since BR no longer existed, I vaguely wondered why it was there. Googling British Rail logo threw up an earlier logo with a lion holding a railway engine wheel that was nicknamed “the ferret and the dartboard” and I knew then I just had to tackle this theme. On my initial sheet of scribblings, is the provisional title Loco Motive. There is also a 13×13 grid with a very poor distorted double arrow logo which contained the words emaNATIONAL and tiRAILleurs inside the horizontal areas of the logo (National Rail being the current user of the logo). That idea went no further. Beneath that poor sketch, I had drawn a more accurate representation of the double arrow. I used this site BR Logo Design as a help to create a 14×8 grid which was the closest I could get to the actual dimensions of the logo. Next to the line junctions, I have written a number of times, such as 4.15, 4.45, 3.30 and 12.15; and next to the grid are the words ‘timetable – clues with train times’. I don’t remember when I wrote that down but I do remember trying to explain my idea to a bemused friend in Pizza Express on Haymarket and drawing clock hands on a napkin with a pen – not to be recommended as a visual aid. What followed was a very slow process to find a grid. Having a 14×8 grid meant I was bound to have shorter down entries so the first words went in the perimeter where longer entries were possible. BRAND AWARENESS was chosen as a hint to logo and also because it began BR and I had a vague idea I wanted to make the all clues about railways. AROUND THE CLOCK followed as a hint to the clocks in the endgame and that led to BRANCHIA, again chosen because of the BR start and the word BRANCH (line). Next I inserted bars so that no word would have more than two clashes, and I tried to ensure the correct number of clues necessary to give the message. You might think that the words to fill the centre could be rather arbitrarily chosen and to some extent that was true. However, if I were to use the timetable idea, there would be no clue numbers in the grid which would lead to a jigsaw puzzle, and so, as a help to solvers, I wanted the clues to be in both timetable and alphabetical order of the answers. I suspected I needed entries with a spread of initial letters. Well, to cut a long story short, I did produce grids in which I think I could have got the across clues in timetable and alphabetical order, but I couldn’t achieve that for both down and across answers. So, choosing a grid, I abandoned the idea and instead simply had two sets of clues in timetable order (all clues including non-clashing ones had a time). The grid was a 14×8 carte blanche. Each clue had a misprint, the corrections to which led to the single message ADD TO CLUE TIMES, INSERT CLOCKS, UNITE HANDS. The title was still Loco Motive which I explained in the notes as logo being a misprint of loco and motive = motif. I sent the puzzle to my very talented test solver who actually managed to solve it. Amongst his comments was the understatement “the combination of jigsaw and carte blanche does lead to an awful lot of cold solving and a great deal of guessing too. You must obviously retain the jigsaw side of the puzzle, and so I suggest that you abandon the carte blanche side.” Looking back, quite how he managed to solve it at all is truly amazing. He went on: “One slight weakness is that 1530, for instance, on a real clock does not in fact have the hands at exact right angles, but I think that solvers will forgive that inaccuracy. They may be less inclined to forgive the fact that some of the times are completely irrelevant”. He also suggested using just Loco as the title. I should have put the puzzle aside for a while but I had spent a long time on it and at the time couldn’t face starting again. So, after changing the title and a few clues, I sent it to Shane Shabankareh, 1st vetter at the Listener, on 31 March 2011. Below is the new grid I sent to Shane, still showing two chains of 9 connected clashes. I might note that getting the time/alphabetical order to work, to use modern parlance, did my head in! It was a huge relief when I got a solution which I did with only 1 minute to spare. Because of restrictions elsewhere, ALAS kept being pushed further and further back until it reached 00:01 If you want to see the effect, just try adding an hour to the time for ALAS and see what happens to the time/alphabetical order further down the chain. More experienced setters might have found a way to predict the changes and select suitable time combinations but for me it was just a pencil and paper and a lot of over-wound clocks before I got there. Shane approved the new grid and reminded me the puzzle would be improved with additional guidance on the drawing of the hour hands (no forgiveness there then!). As many of you will have realised during the endgame of this puzzle, it is impossible to use the hands of clocks to indicate the precise angles required to get the slanting lines. It should be possible using the hour hand for the vertical lines and the minute hand for the horizontal and slanting lines but that would lead to severe constraints on the clocks available for use at clashes. Even using the second message HOUR HANDS POINT DIRECTLY AT RELEVANT HOUR which gives accurate vertical & horizontal indications, one can still only get an approximation of the required angle for slanting lines and so I could only hope the second message would be enough to satisfy the vetters and most solvers, which turned out to be the case. I still wanted to use misprints in clues to justify LOCO/LOGO and so I set to work writing a set of clues for the new grid with both corrections and misprints leading to the two messages, which, I discovered, are not the easiest clues to write! I did attempt restricting the misprints to the definition but had to give up as it was leading to some very forced surface readings. Even allowing the misprint to occur anywhere in the clue was difficult. 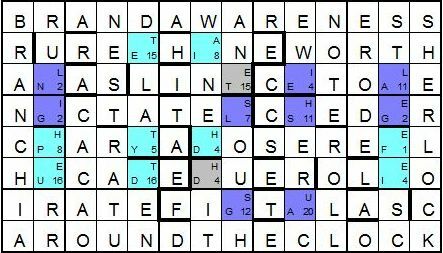 For example, in the clue to SHERLOCK, I needed an L to be corrected to U; finding a word at all was hard enough, but one that was useable in the clue was even harder and in this case resulted in the less than satisfactory LP becoming UP, the capitalisation of which some solvers didn’t like. I do understand and would have avoided it if I could, but I ran out of options. One of the best things about the Listener crossword is the range of styles and difficulty on offer throughout the year. I felt with the station clues now identifying the framework, it should be easier, more enjoyable and fairer to solve the puzzle. However this was a challenge for me to set and so I deliberately devised clues at the harder end of the range, though I did produce a few easier ones to get solvers started. After a few more amendments (including separating out all the station clues instead of having Across and Down stations) the grid, clues and messages were accepted and towards the end of December 2011, Shane forwarded the puzzle to 2nd vetter, Roger Phillips. Whilst on holiday in January 2012 I got an email from Roger saying the puzzle had been accepted for publication. Following some further clue alterations and rewrites, the puzzle was basically finished by the end of February 2012, just over a year after I had begun it. Even so, following another holiday in June 2012, I sent a suggested change to a clue (NICTATES) which had bothered us all. The change was accepted as an improvement and that was it until the beginning of August when I was informed of the publication date and sent proofs. And so in its final form, the puzzle involved three stages. 1. Filling the grid and getting the letters from misprints and corrections in clues. 2. Rearranging the letters in conventional clue order to get the instructions/messages. 3. Calculating the clock times and then inserting and joining the hands to produce the BR logo which I hoped would be a good enough PDM to justify all the hard work solvers would have to go through. Judging by the comments I received, those who correctly found the BR logo (the majority) liked the puzzle and those who didn’t find it were understandably frustrated. I do sympathise; I have been in the position myself where I have a complete grid but cannot complete the endgame. I did not set out to frustrate solvers, and the vetters did their best to ensure the puzzle was fair, but they could only work with the material I sent them and so all the puzzle’s remaining shortcomings are mine. Thank you to all those solvers who took the time to post on message boards or send their solving experiences and comments on this puzzle to John Green. A big thank you too to Roddy Forman (Radix) my test solver, Shane and Roger and JG at the Listener and to Dave Hennings for doing such a fantastic job of running ‘Listen with Others’ and keeping us entertained week after week with the blogs and still finding time to run the amazing Crossword Database. Finally thank you to George Heard at George Versus The Listener Crossword for making me smile every week – and congratulations on solving and blogging Loco. If you get something out of these entries, please do consider joining Dave Hennings and Shirley Curran and their fellow bloggers by posting your solving and setting blogs too. And, if you like advanced thematic crosswords as much as I do, you really should subscribe to Magpie. There are five crosswords (and a numerical puzzle), graded according to difficulty in each monthly issue. There are three prizes each month and statistics on-line for those who want to set further challenges for themselves with all-correct targets. It is far cheaper than buying any of the expensive weekend papers and the magazine does not have the same restrictions on grids or size that newspapers have and so puzzles can be, and regularly are, even more inventive. This entry was posted on 9 October 2012 at 2:00 pm	and is filed under Solving Blogs. You can follow any responses to this entry through the RSS 2.0 feed. You can leave a response, or trackback from your own site.